Archaeologists working at the Pocklington burial site in Yorkshire have discovered the 2,500-year-old skeletal remains of a high ranking warrior who was buried alongside his sword—and who had a half-dozen spears thrust into him in ritualistic fashion. 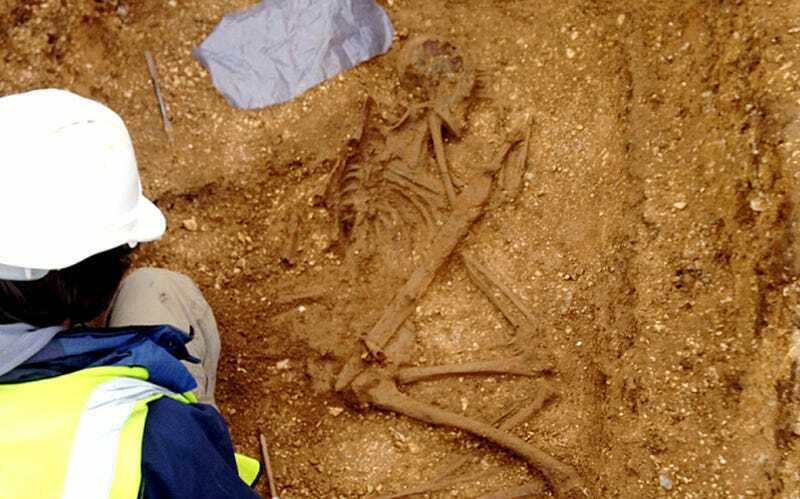 The “speared burial” figure was discovered among 75 burial chambers, also known as barrows, containing over 160 iron age skeletons dating back to between 800 BC to the the start of the first millennium. These folks belonged to the Arras culture, a group who lived in the area during the middle period of the iron age. The Pocklington burial site, discovered just two years ago, has been described as one of the largest and most significant iron age finds in recent times. The young man, possibly a warrior of significance, was in his late teens or early twenties when he died. According to archaeologist Paula Ware of MAP Archaeological Practice, the man had been carefully placed into the grave in a crouched position. His sword was then placed by his side, where it dutifully remained for thousands of years. The mourners then jabbed four spears along his spine, and another into his groin. Ware said this would have produced a mound with the spear shafts protruding outwards like “the spikes of a hedgehog,” where they would have remained visible for years. Other findings included another warrior buried atop his shield, and a woman who had died during childbirth. Numerous bodies were found buried without accompanying objects, but some were interred with brooches, bracelets, pendants, glass beads, pots, and various prehistoric weapons. As more bodies are uncovered, the archaeologists say a pattern is emerging. In addition to working out the various causes of death, the archaeologists are hoping to conduct DNA analysis to determine whether or not the Arras people were indigenous or migrants from Europe, including France or Germany.